Great dining options are available on campus throughout the weekend. 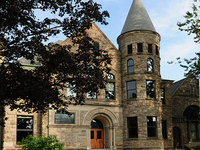 Served 10:45 a.m.–2 p.m. on Sunday, May 5, at Phelps Hall. Brunch tickets can be purchased in advance starting April 10, 2019, by calling the Ticket Office at 616-395-7890. Ticket Office hours are Monday–Friday, 9 a.m.–5 p.m. Graduates and two family members eat for free. We recommended that you get your tickets in advance. There is no ticket limit in Phelps, and cash sales will be available the day of Commencement. Please pick up your tickets in person from the Ticket Office in the Anderson-Werkman building. Tickets not picked up by May 3 will be held at the door of the appropriate dining hall. Check out the daily menus for on-campus meals.